Gold was weaker overnight in a range of $1344.70 - $1356.75. It did tick up to its high (5-week high) during late Asian/early European time as the dollar continued to soften, but resistance at the down trendline from the $1366 high on 1/25 at $1356 held. The DX fell to a 5 week low of 88.94, pressured by a stronger euro ($1.2442 - $1.2475). Later on, weaker reports on German Import Prices, Eurozone Business Climate and Industrial Confidence, along with some dovish commentary from the ECB’s Liikanen (cautions against tightening ECB policy too soon) knocked the euro down to $1.2372. The pound also softened ($1.4240 - $1.4066), which drove the DX back up to 89.64, and forced gold lower. The yellow metal fell through some stops under $1350 and yesterday’s low of $1343 to reach $1340.30 (support a the old triple top) just ahead of the NY open. A continued rebound in global equities was also a headwind for gold with the NIKKEI up 2.4%, the SCI up 1.1%, Eurozone shares were +1.5% to 2.0%, and S&P futures were +0.7%. A continued firming in oil (WTI to $66.38) was supportive of stocks. US equities opened stronger (S&P +3 to 2670, telecom leads gainers) helped by a better than expected reading on the Case/Shiller Home Price Index (0.75% vs. exp. 0.6%), which pressed gold to its low of $1340. At 10AM, however, worse than anticipated reports on Consumer Confidence (127.7 vs. exp. 131) and the Richmond Fed Manufacturing Index (15 vs. 22) turned equities negative (S&P -6 to 2652), and pushed the US 10-year bond yield down to 2.815%. The DX pulled back to 89.34, and boosted gold back to $1343.50. Into the afternoon, US stocks turned back higher (S&P +18 to 2675), but the 10-year yield continued to slide (2.799%, strong 5-year auction). 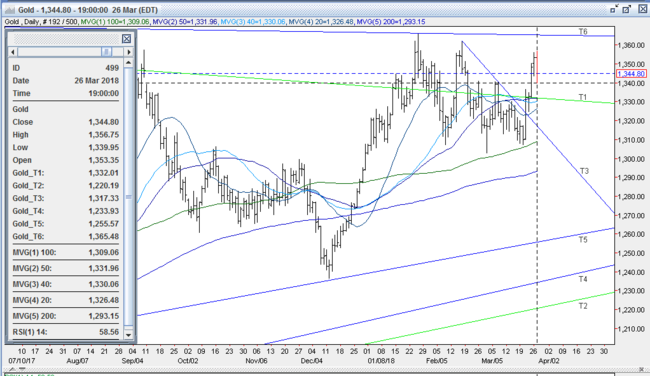 The dollar, caught in the cross-currents, probed lower, and dipped to 89.29. Gold traded higher in response, and touched $1345.75. Later in the afternoon, equities sold off sharply with the S&P dropping 45 points to 2612, as the tech sector was clobbered. 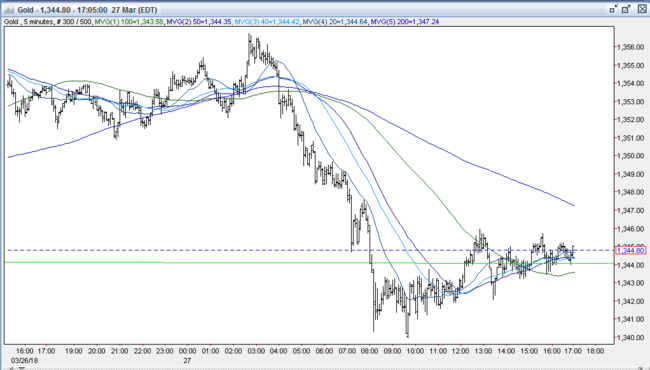 A drop in oil (WTI to $64.65) contributed to the decline. Some late dovish comments from the Fed’s Bostic (sympathetic to adopting price-level targeting) helped to stem the decline. The 10-year bond attracted some safe haven players and the yield slid to 2.77% - 7-week low. The dollar remained remarkably steady, however, trading narrowly between 89.30 – 89.40. Gold was likewise stable, and remained within a $1342.50 - $1345.50 band and was $1344 bid at 4PM with a loss of $9. Open interest was off 12.7k contracts, showing a net of short covering from yesterday’s advance. Volume was a little lower – but extremely robust – with 554k contracts trading. Bulls were disappointed at gold’s failure to take out the down trendline at $1356 (from 1/25/18 $1366 high), and that it couldn’t climb back over $1350 – given the late selloff in stocks, the 10-year yield dipping under 2.80% to make 7-week low, and the DX under 89.50. However, having climbed nearly $50 from its $1307 low last week, some bulls feel a consolidation should be warranted. The bulls think they have the large fund positioning on their side, with a relative dearth of long positions limiting liquidating headwinds, and allowing room for momentum players to come aboard the long side, along with and a significant amount of shorts that can extend any future rallies. They look for a break back above $1350 and then $1356 to bring tests of next resistance at $1362 (2/16 high) and then $1365-67 (5 tops 1/25, 8/2/16, 8/3/16, 8/4/16, and 8/5/16 highs, down trendline from 7/6/16 $1375 high). Bears are still comfortable selling into strength, and feel the nearly $50 rally over the past week has been overdone. They’ll initially look for a quick pullback to the 50% retracement of the move from $1307 - $1356 to $1331, and then to test next support at 3/22 low at $1325. All markets will continue to focus on the volatility in the equity and bond markets, geopolitical events, developments with the Trump Administration, oil prices, and will turn to reports tomorrow on Germany’s GfK Consumer Confidence, US Trade Balance, Wholesale Inventories, GDP, PCE, Pending Home Sales, and Oil Inventories for near-term guidance. Is gold headed to $1500 this spring?